Eco-Friendly Power Generation, EnviroPower Renewable Inc.
Gasification is a clean and efficient process to recover energy from several types of solid waste. It is a process whereby combustible waste is heated in a low oxygen environment to a temperature at which the solid materials are converted to a gas. Since the gasification process is carried out with only partial combustion, it produces a clean burning fuel gas generally known as syngas. The fuel components in this gas are mainly carbon monoxide, hydrogen, and methane, which are cleanly combusted in a separate and carefully controlled process that produces exceedingly low concentrations of NOx, SOx, and VOCs, and essentially no harmful dioxins or furans as compared to incineration. As a bonus, gasification helps preserve the environment by reducing the amount of materials going to landfills (by 90% or more in most cases). 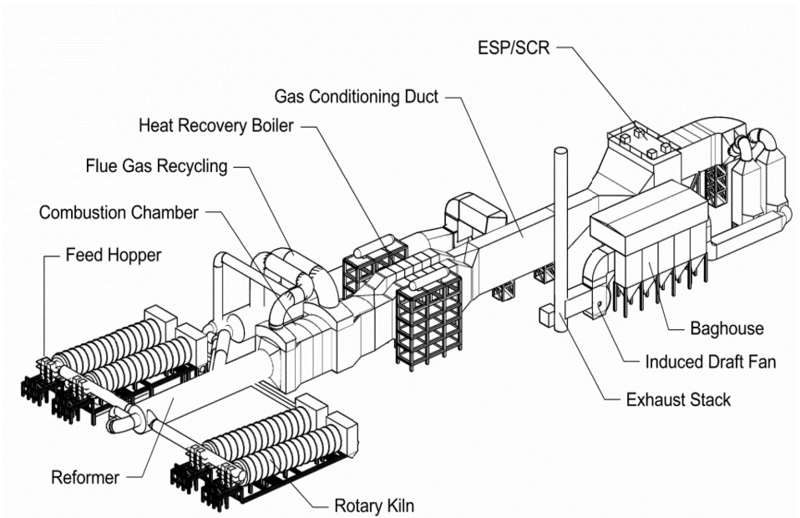 When properly designed and operated, simple air fed gasification (such as the system shown top left) is a much less expensive and cleaner means for producing electricity from waste compared to incineration. 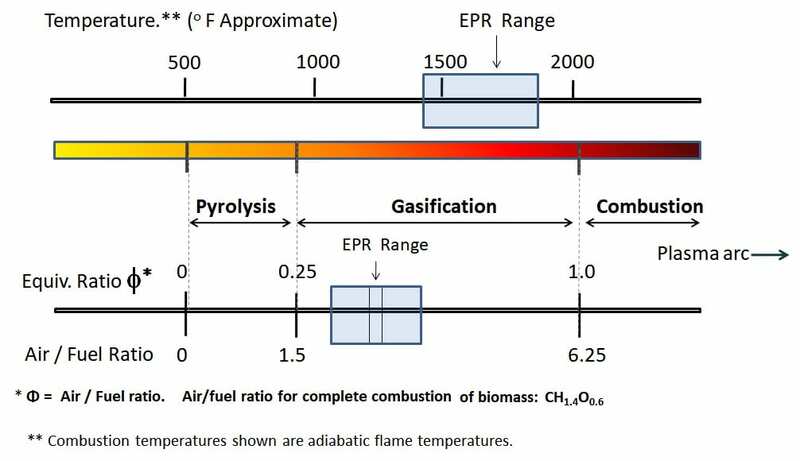 Left: The graphic to the left illustrates the various temperatures and air to fuel ratios that differentiate gasification from pyrolysis and combustion processes. 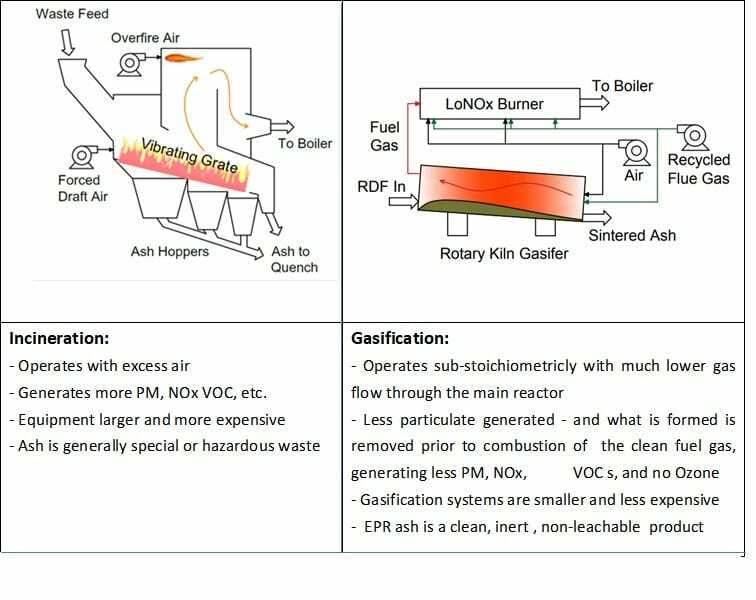 Left Below: The graphic to the left below illustrates the important differences between incineration and gasification. As shown, incinerators introduce enough air to combust the fuel into the main reactor, greatly increasing mass transfer and entrainment of particulate matter. Gasification operates with approximately 30% of the total air required for complete combustion, thus greatly reducing mass flow through the initial reactor. 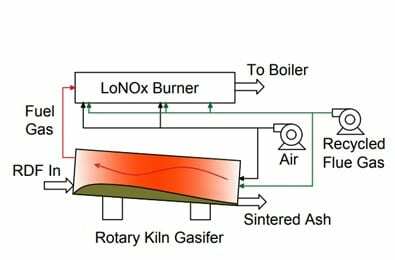 The fuel gas produced in the main rotary kiln reactor is reformed to crack any tars and then combusted in stages at temperatures below those which give rise to thermal NOx. Ability to process a wide variety of gaseous, liquid, and solid state feed stocks. 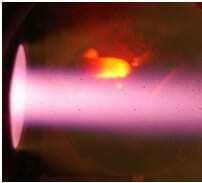 Conventional air fed gasification, as used by EPR, is very different from plasma arc gasification. As shown in the image to the right, plasma arc gasification requires large amounts of energy to strike and maintain a high current electric arc between electrodes within the source or between the source and reaction chamber. 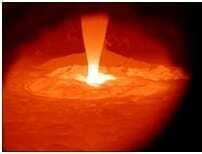 A great deal of money has been spent on plasma arc gasification. While this technology may have limited use in the safe disposal of certain hazardous materials, it is neither theoretically or practically viable for large scale conversion of non-hazardous solid waste to energy. Operating experience to date has clearly borne this out. After hundreds of millions of dollars invested, there is today not a single plasma arc gasification system that is operating at a commercial scale on solid waste. In contrast, conventional air fed gasifiers have been operating safely, efficiently and reliably on a commercial scale using a wide variety of solid waste and biomass fuels for more than three decades. If the fuel gas generated by gasification must be cleaned in order to be used in internal combustion engines, reforming with oxygen is a much less expensive and more effective means of removing tars and reducing the probability that free radicals produced at plasma torch temperatures will cyclize during the gas cooling process.